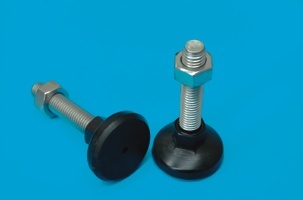 Blyth Enterprises supply the largest range of adjustable levelling feet in Western Australia. 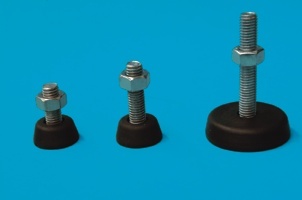 We stock a range of sizes of adjustable levelling feet for the purpose of using on light domestic furniture and machinery. These adjustable levelling feet are ideal for lightweight equipment that requires feet to be adjusted to the level of the stabilising floor. There are many uses for the fixed adjustable foot, and we often supply to businesses in the hospitality, retail, food, mining, medical, education, manufacturing and private homeowners. Talk to us today about your needs and give us a call, email or come into our Osborne Park warehouse today. The CFR Range has a synthetic rubber shore 73 base, giving anti-slip and anti-vibration qualities, while the stud and locknut are available in either 304 stainless steel OR zinc plated mild steel. The CFP Range has a nylon 6 plastic base, while the stud and locknut are available in either 304 stainless steel OR zinc plated mild steel.